In preparation for the upcoming E! People’s Choice Awards, airing on Sunday November 11th, the folks at E! have launched a voting campaign to get your vote for the best in TV, Movies, Music, and Pop Culture. Click here to visit the site where you can cast your selections. The voting window is now open and closes October 19th so time is of the essence if you want to make your voice heard. As an extra bonus E! 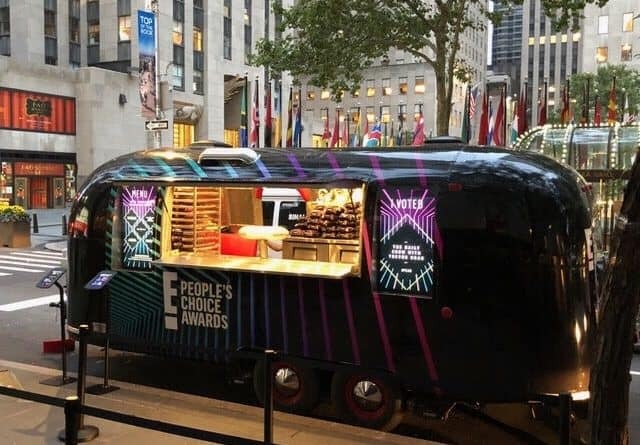 is deploying food trucks as part of a cross-country campaign with stops in New York, Austin, and Los Angeles for fans to cast their vote and in exchange enjoy delicious offerings from a menu inspired by the finalists. The process at the truck is simple. When you arrive at the truck you place your vote for your desired E! People’s Choice Awards category and in return you will receive a free, customized, Instagrammable food item representing your choice. You can then post photos with the hashtag #PCAs on social media. Thursday, October 18 and Friday, October 19; Thursday from 11:00am-5:00pm and Friday in the afternoon/evening time. The E! People’s Choice Awards will air Sunday, November 11 at 9 p.m., only on E! 10/3 Update: We learned today that Melanie Scrofano from Wynonna Earp will be at the truck on Thursday October 4th from 3-5pm!